Each month I work on a challenge to MAKE something with supplies from Michaels Stores, this January the other Michaels Makers and I are tackling storage and organization. My husband and I didn’t know what to expect when we looked at our house for the first time. The house was listed as a tear down, the only picture online was the exterior of the house. 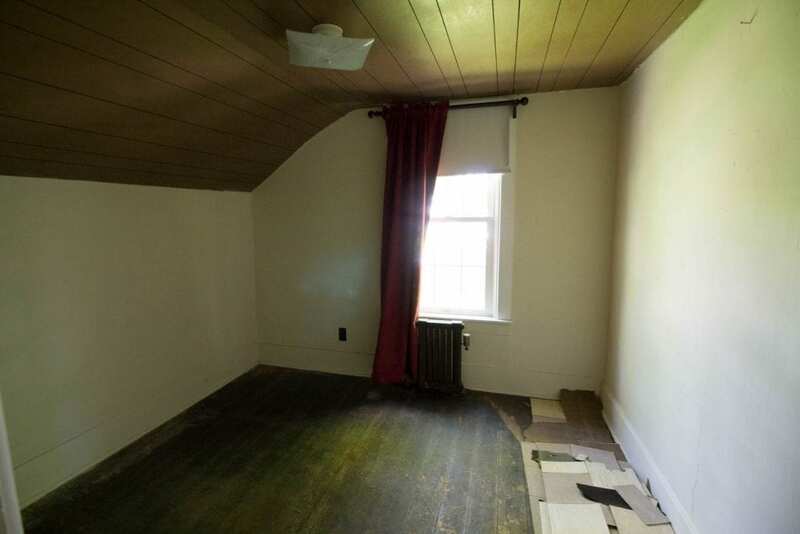 When we took a tour, not only did the home have 4 bedrooms (3 upstairs, 1 downstairs) – but it also had a bonus room on the 2nd floor, which looked dark and tiny. I thought it’d eventually make a good office/nursery. To fix the crumbling ceiling underneath, we added a planked wood ceiling, then painted everything white. The wood floor you see in the picture above is the same wood flooring in the room today! We had a local company refinish the original wood underlayment and it turned out beautiful. They sanded the floors, added three coats of satin polyurethane, and this is what we got. Our last home had a great office/crafting space, but supplies were stored in our basement. Since this room is on the 2nd floor, I wanted to have anything we’d need stored up here. I bought two of these shelves on Michaels.com, and the baskets at my local store. I used four different sizes of baskets in here. I usually prefer clear bins to see the contents, but in here I wanted the storage to be a part of the decor. 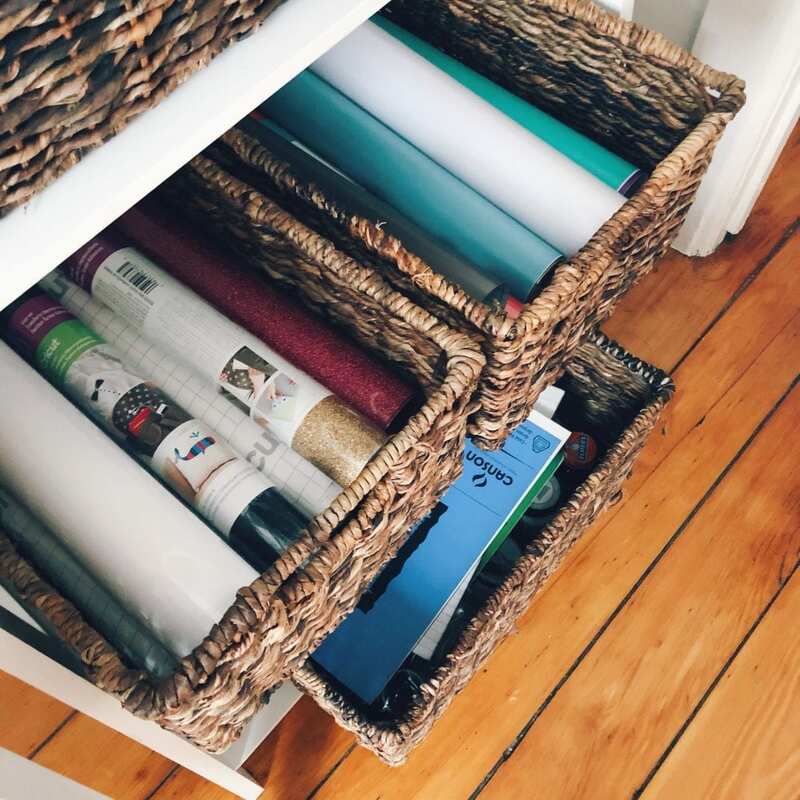 The hidden storage works for our cords, office supplies, cameras, and miscellaneous crafting items like rolls of vinyl. 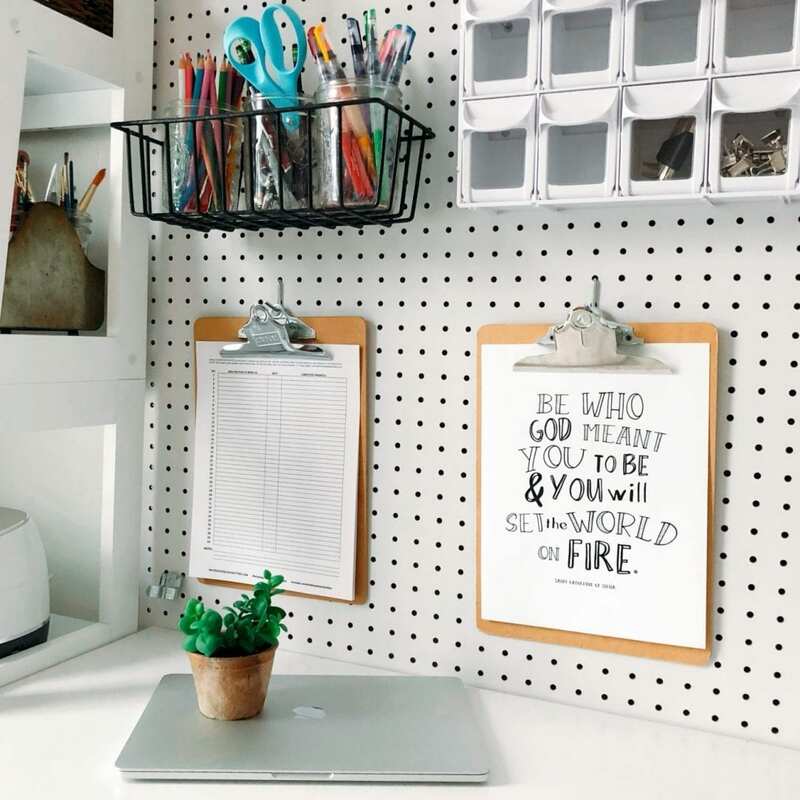 The pegboard, mounting hardware, hanging basket and hooks for the pegboard were purchased from a local big box hardware store. 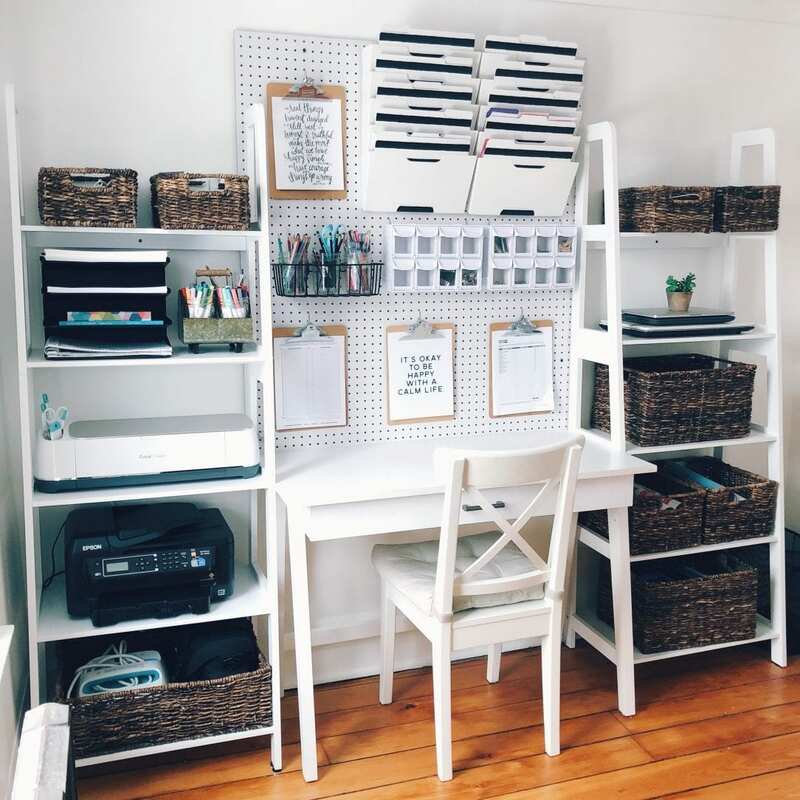 Most stores will even cut the pegboard down to size for you. The hanging white and clear storage bins were also from Michaels, they’re great for tiny things which might otherwise get lost in a big basket. 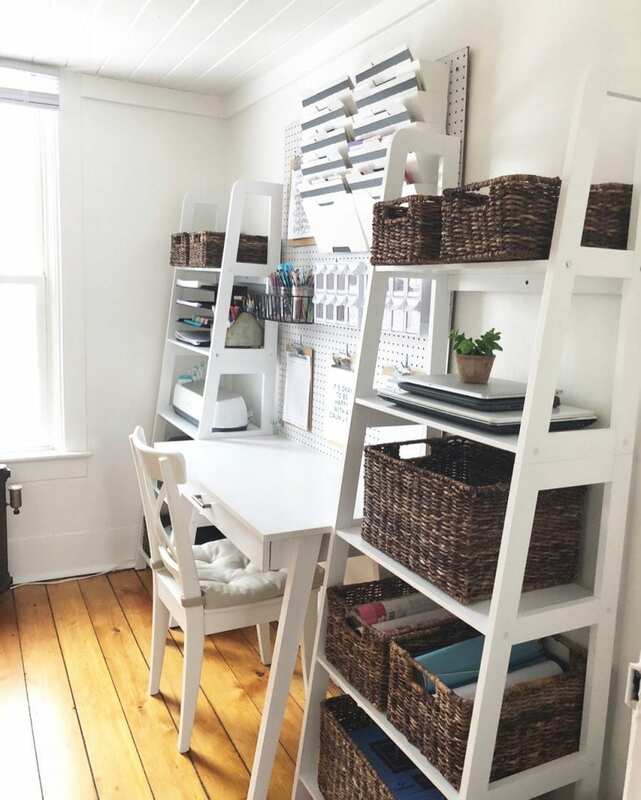 It’s so nice to have an organized, bright space to sit down and work! The room felt like a dungeon before, the white paint and refinished flooring did wonders to brighten things up in here. Michaels has everything you need to get organized for the new year! 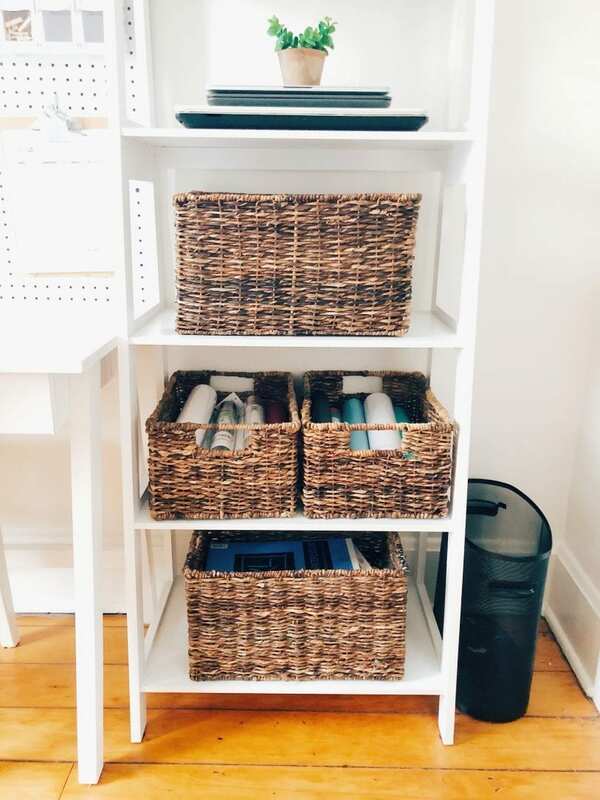 From washi storage to lexington carts, you can MAKE your year the most organized one yet. This post is sponsored by Michaels Stores. I am a Michaels Makers project creator and was provided with store credit to purchase products for this post. All ideas and opinions are my own, and I only recommend products I would use again. « Looking Back on 2017! 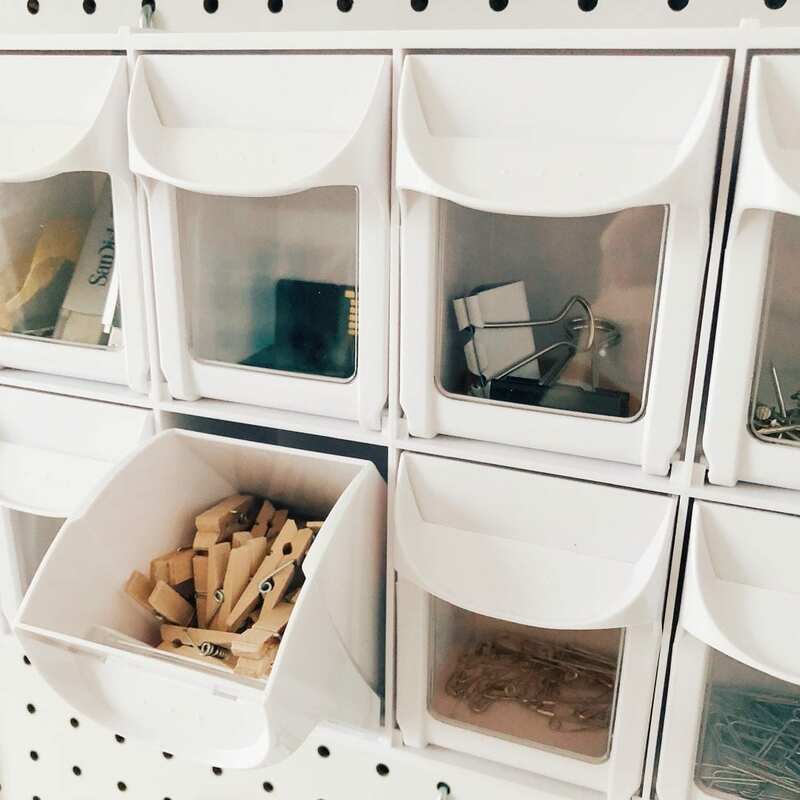 I love the clear storage cubby/drawer thing on the peg board but can’t seem to find it in the michaels website.what is it called? I couldn’t find it on their site, but it was in my store. It was located on the storage displays in the middle of the aisle, and also came in pink and mint. I hope that helps! I will see if I still have the wrapped packaging/label, but I think it went out with the recycling. I love it! I love all those baskets, they look so nice! The whole room looks so different! You guys are doing a great job on your house.